It’s an older apartment building like many others in Crown Heights: the heavy doors that clang shut when you’re buzzed in, the cavernous lobby that echoes with the sound of children playing in the stairwells, the concrete walls painted in shades of landlord yellow and dark brick. But up a flight or two, hidden behind one of many identical doors, one of Jewish music’s newest singing stars has found a place to enjoy his private life in quiet anonymity. Benny Friedman came onto the music scene in 2009 with the release of his album Taamu, a collection of lively, pop-style songs produced by Avi Newmark. Musical talent — or more specifically, a mellifluous, expressive tenor voice — clearly runs through the male Friedman line: Benny’s uncle (his father’s brother) is Jewish music superstar Avraham Fried. 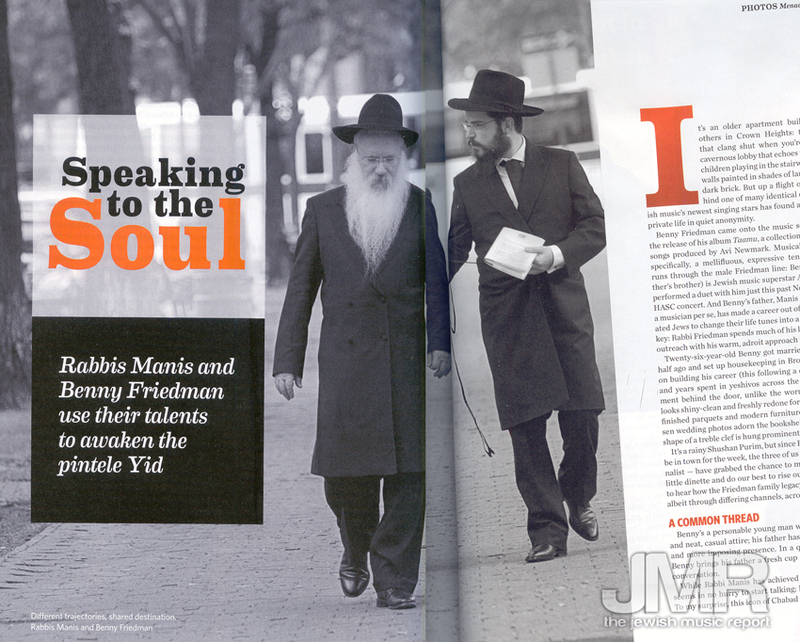 And Benny’s father, Manis Friedman, while not a musician per se, has made a career out of persuading unaffiliated Jews to change their life tunes into a more soulful Jewish key: Rabbi Friedman spends much of his life on the road doing outreach with his warm, adroit approach to kiruv. Twenty-six-year-old Benny got married about a year and a half ago and set up housekeeping in Brooklyn to concentrate on building his career (this following a childhood in St. Paul, and years spent in yeshivos and shlichus across the country). The apartment behind the door, unlike the worn lobby and hallways, looks shiny-clean and freshly redone for a new couple, with refinished parquets and modern furniture. A few carefully chosen wedding photos adorn the bookshelves, and a clock in the shape of a treble clef is hung prominently on the wall. It’s a rainy Shushan Purim, but since Rabbi Manis happens to be in town for the week, the three of us — father, son, and journalist — have grabbed the chance to meet. We sit down at the little dinette and do our best to rise out of the post-Purim fog to hear how the Friedman family legacy has been passed down, albeit through differing channels, across the generations. Benny’s a personable young man with a short brown beard and neat, casual attire; his father has a spreading white beard and more imposing presence. In a quiet gesture of kibud av, Benny brings his father a fresh cup of coffee as we begin the conversation. While Rabbi Manis has achieved renown as a speaker, he seems in no hurry to start talking; he waits to be drawn out. To my surprise, this icon of Chabad outreach answers my first question by informing me that his own parents were not originally Lubavitcher chassidim. “My father was from Poland, my mother from the Ukraine,” he says. 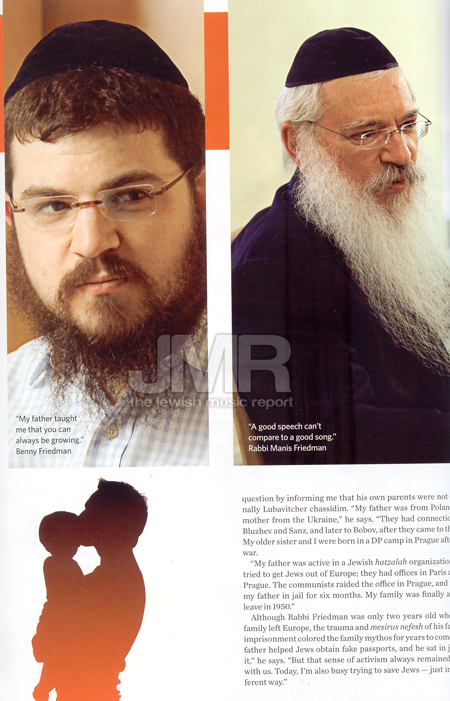 “They had connections to Bluzhev and Sanz, and later to Bobov, after they came to the US. My older sister and I were born in a DP camp in Prague after the war. Rabbi Friedman’s family settled in Crown Heights in an era when Crown Heights was a diverse Jewish immigrant neighborhood. “The Bobover Rebbe used to be in Crown Heights, on St. Marks Street,” Rabbi Friedman says, explaining how his parents developed a connection to Bobov. But over the years, as the family grew in size (there would eventually be eight children), they were drawn into Lubavitcher Chassidus, where all the children achieved prominent positions. The two daughters became shluchos in Detroit and the Long Beach, California, area, respectively. Rabbi Friedman had been sent on shlichus to the Twin Cities in Minnesota, and had the idea to invite women college students from campuses all over the US for a summer session of Torah learning. At the time, he said, it was “unheard of” to teach women — especially, perhaps, for a twenty-one year old Lubavitcher chassid. So he found some improvised teachers, in the form of some of the sixteen-year-old girls from Crown Heights who’d come to St. Paul to help with the summer day camp. In this rather makeshift way, Bais Chana was created, a first spark which Rabbi Friedman claims eventually ignited such important spinoffs as Machon Chana in Crown Heights and Neve Yerushalayim in Israel. “We would only get the women to the first rung, getting them interested in learning more,” he says. He says that today even the frum-from-birth kids are sometimes lacking in basic Jewish fundamentals, going to yeshivos that emphasize memorization over principles. “What’s taught in the baal teshuvah yeshivos is more real, more close to the core of Yiddishkeit than a lot of what kids in yeshivos are taught,” he affirms. “Sometimes the frum kids get to real life and find they don’t have anything meaningful to fall back on.” He compares it to heating a home: if you manage to heat one room really well, the rest of the house will become somewhat warm. But if the fireplace isn’t hot enough — if our teachers aren’t truly inspired — then you can’t hope to spread the warmth. “Then the game is over,” he says. In order to answer those questions, Rabbi Friedman found himself pulled into round-the-clock learning that would “begin at eight in the morning and end at eight in the morning.” He says he’d lie down on the carpet, grab a few hours of sleep, and start the intellectual tug-of-war over again. As exhausting as it was, it was successful enough to warrant repeating a second year. In the last twenty years, he says, the system has become more sophisticated. Applicants are screened more carefully, and sessions are divided: teenagers, college students, married women, couples, even single mothers (“The divorced mothers are amazing,” Rabbi Friedman remarks. “They have horror stories, real scars, and yet they handle their lives so bravely, with so little support from the community.”) Now that society has moved well beyond the Vietnam War, Buddhism, and macrobiotic food, I ask, what are the burning issues of 2011? In fact, Rabbi Friedman says sometimes the teens from nonobservant families have a keener sense of what’s missing than the kids from frum homes. “We underestimate those kids,” he claims. “But they have a deep understanding of what’s missing and how things are supposed to be. We need to get back to basics! We’ve lost all sense of what it means to be a husband, a wife, a parent — I regularly ask people to define the terms husband and wife, and they’re stumped. They get married not knowing how to make the change from man and woman to husband and wife. They get married without knowing what it means to be committed to a marriage. Rabbi Manis Friedman was busy with more than kiruv during the past four decades in Minnesota: he and his wife were also busily raising, bli ayin hara, fourteen children, of which two are still living at home. Benny is the eleventh child; “I’m the oldest of four,” he jokes. There are people who find it hard to be part of a mega-sized family — the noise, the lack of privacy, getting lost in the middle. But Benny seems unfazed; on the contrary, he says, “It was always a party by us.” He didn’t even mind not having his own room. Benny was nevertheless shipped out of the house from the age of twelve, to attend yeshivah two and a half hours away in Postville, Iowa, in the halcyon years before the 2008 raid that nearly destroyed the town. (“It was a great community then,” father and son both sigh.) 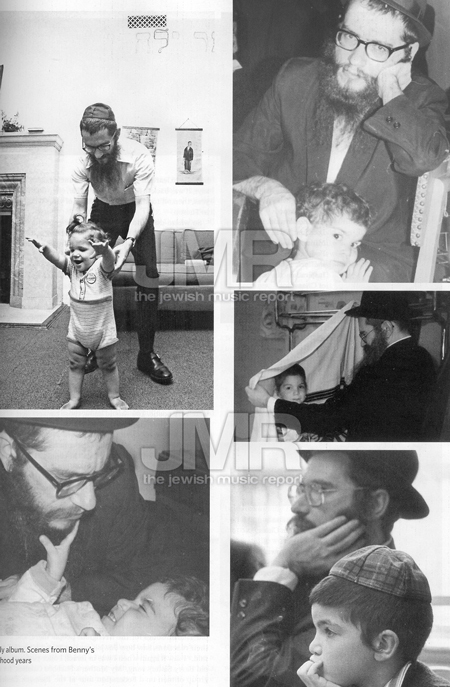 At age fifteen, he went off to Tzfas to learn in yeshivah, near his uncle’s home. Then, he says, it was back to Minnesota for a year, off to California for a year, then off to Miami, with a couple of years doing shlichus in Tucson. So where does the passion for music come in? Were the Friedmans one of those families that sing zmiros in four-part harmonies every Shabbos?